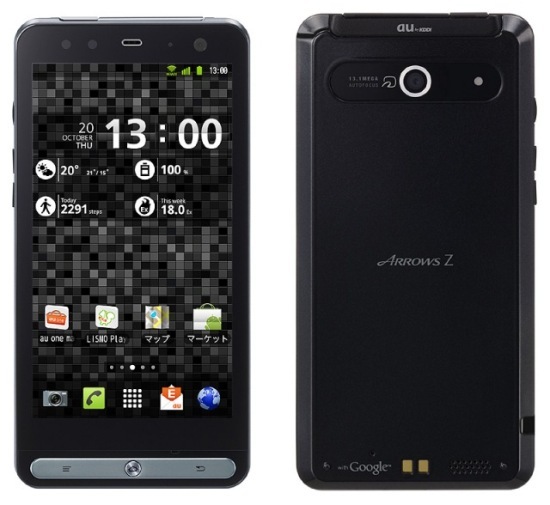 Fujitsu-Toshiba Mobile has recently launched the ARROWS Z ISW11F in Japan, which is a heavy-feature loaded handset. To start with, the device has a 4.3 inch LCD display, will run on a 1.2 GHz dual-core TI OMAP4430 processor with 1GB of RAM. Internal memory is 8GB and there is a microSD slot to expand it up to 32GB. And the device is also waterproof. That’s not all, there is a 13MP CMOS camera (Exmor R for mobile, ISO25600) at the back which is capable of recording videos at 1080p and also a 1.3 MP front camera for video calls. It’ll run on the latest Android 2.3.5 and will support GSM/CDMA radios and e-wallet functioning. It also has an in-built digital TV tuner, Wifi, WiMAX, and Bluetooth. To end it, it even has Infra-red connectivity and an HDMI port. The ARROW Z is not expected to sell outside Japan, but the company must think over the decision as it may sell like hot-cakes in the rest of the world. What do you think?